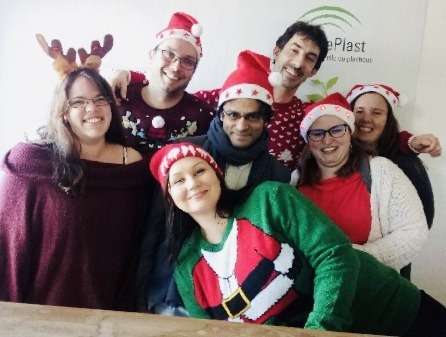 Everyone at NaturePlast-BiopolyNov wishes you and your family a happy new year 2019! May this new year bring you health, joy, personal and professional success. During the last year, the growth of NaturePlast activity allowed us to expand the team through the recruitment of a Workshop Manager. Deborah has joined us last July and is responsible for the extrusion, injection molding and by-products treatment activities. During the All4pack fair that took place in Paris end of November, the possibilities of by-products incorporation in bioplastics have strongly interested journalists of the TV show “Télématin”. They have dedicated a report on their use in plastics processing. In the framework of the search for a circular economy and a by-products recovery, NaturePlast’s “by-products” activity has strongly developed. Indeed, in 2018, the addition of an algae based biocomposites range has enhanced the compound catalogue offed by NaturePlast. With a by-product based biocomposites portfolio diversified, NaturePlast has created a portfolio entirely dedicated to its range “by-products”, that you can find here. A life cycle assessment (LCA) has also been carried out in order to determine the improvement of the environmental impact of the biocomposites and by-products produced during the project COPROPLAST. This study has demonstrated the environmental advantage to use by-products with biobased or fossil-based matrixes, notably from the point of view of some criteria like fossil energy consumption or greenhouse gas emission. More information here. Collaborative projects are important for NaturePlast because they represent non-negligible benefits notably for a SME. Indeed, in addition to participate at innovative projects and to strengthen our knowledge, it’s a way to develop our network, either at a European level or a national level but it’s also a way to have a visibility on our activity. The COPROPLAST project (financed by the “Region Normandie” and the FEDER) has ended last June after 3 years of work on the by-products study with the collaboration of the cooperative AGRIAL. During this project, numerous by-products from cereals, fruits or vegetables branches have been tested. Their incorporation at various rate and grain size has shown their interest to be use as a filler but also as a reinforcement in some cases for example. Another conclusion that was brought to light is that the chemical composition of some by-products makes possible the production of 100 % biobased polymer like plasticised starch. This potential offers new ways of exploration that NaturePlast hopes to pursue on another project. More than 11 by-products tested under more than 60 different ways. More than 110 compounds developed, hundreds of characterizations carried out. A compete life cycle assessment made. In 2018, The Interreg North-West Europe project WOW! 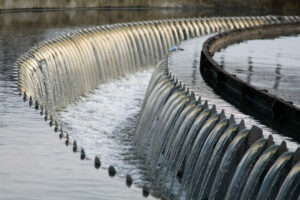 – Wider business Opportunities for raw materials from Waste water (sewage) has officially started. This project aims to make the transition to a more circular approach by matching supply and demand of cellulose, lipids and bioplastics (PHA) from sewage. You can find the latest information about this project on this link. NaturePlast participates also at the European project MYPACK. This innovative project supported by HORIZON 2020 (call SFS-2016-2017) has for objective to help sustainable food packaging technologies to reach or to extend their market. A year after the launch of the project, the different partners met each other in Thessaloniki (Greece) on the 4th and 5th of December in order to provide an overview of the project progress and to discuss how to move forward. You can find the latest information about MYPACK on the project’s website. The BIOCOMPLACK project aims to produce a new biobased, biodegradable and compostable food packaging by using a cellulose nanocrystals multilayer structure to enhance the barrier properties. In 2018, the scale up of the compounds and PLA based films production was made and optimised. Finally, the European project (Horizon 2020) DEEP PURPLE has been accepted by the European commission last December! The objective is to create a versatile, integrated and flexible Multi-Platform biorefinery to extract and recover high added-value compounds from Urban Waste Streams for a wide variety of biobased products of several industrial sectors. The project should start during the second trimester of 2019. Do not hesitate to bring us your project idea, NaturePlast is always ready to share its knowledge in the framework of new projects! About us: NaturePlast is a french company based in Normandy (IFS-14), specialized in bioplastics. With more than 10 years of experience in this field, the company has the most extensive portfolio of raw materials and biobased and/or biodegradable compounds in Europe. With its daughter company BiopolyNov, they provide support to industrialists from the origin to the industrialisation of their innovative project. Thanks to their R&D expertise acquired during the years, NaturePlast and BiopolyNov are renowned major player in the development and production of formulations for clients and collaborative projects.